During June 2009, conditions across the equatorial Pacific Ocean transitioned from ENSO-neutral to El Niño conditions. Sea surface temperature (SST) anomalies continued to increase, with the latest weekly departures exceeding +1.0°C along a narrow band in the eastern equatorial Pacific. Sea surface temperatures have steadily increased across all of the monitored regions. Model forecasts indicate a consensus for further development of El Niño conditions, although there is a range of indications for the maximum intensity. Current conditions and trends imply a "weak-to-moderate strength El Niño into the Northern Hemisphere Fall 2009" and possible further strengthening into the winter. El Niño usually has weak impacts on the U.S. during summer and fall, but there is some tendency to suppress Atlantic hurricane activity because of increased wind shear. On the other hand, a recently published study shows that the effect on hurricane development may depend on whether the maximum temperature effects occur in the eastern or central Pacific. In years with eastern Pacific maximum warmth, tropical cyclone activity seems to be lower. So far, at least, the current pattern appears to be the eastern Pacific variety. NOAA's hurricane season forecast will be updated along with the next El Niño analysis on August 6. By increasing the strength of the southern branch of the jet stream, El Niño tends to favor increased winter storminess on the U.S. Pacific Coast, more rainfall in the Southwest, and less wintry weather in the northern portion of the country. As a transitional zone, the Mid Atlantic region can be affected both positively and negatively in the winter depending on the particular pattern of strength and evolution of the El Niño conditions. A RECORD HIGH TEMPERATURE OF 104 DEGREES WAS SET AT MCALLEN TODAY. THIS EXCEEDS THE OLD RECORD OF 103 SET IN 2005. HIGH FOR THIS DATE. THE PREVIOUS RECORD WAS 103 SET IN 1978. RECORD HIGH FOR THIS DATE SET IN 1917. WAS FIRST SET ON THIS DATE IN 1980. A RECORD HIGH TEMPERATURE OF 104 DEGREES WAS SET AT AUSTIN BERGSTROM TODAY. HIGHS IN JUNE AND HAS TIED OR BROKEN 4 MORE IN JULY. AFTERNOON HIGHS AVERAGING NEAR 5 TO 10 DEGREES WARMER THAN USUAL. BEEN AROUND 100 TO 102. FOR THE 3RD WARMEST JUNE AT SAN ANTONIO WITH JUNE 1998. THE MONTH OF JUNE. THE OLD RECORD WAS 11 DAYS IN JUNE 1990. AT AUSTIN...DEL RIO...AND SAN ANTONIO ARE LISTED BELOW. YESTERDAY. THIS BREAKS THE PREVIOUS RECORD OF 77 SET IN 1949. DATE...WHICH PREVIOUSLY WAS 96 DEGREES SET BACK IN 1924. THE OLD RECORD HIGH TEMPERATURE FOR THIS DATE...SET BACK IN 1992. AIRPORT TODAY. THIS TIES THE OLD RECORD OF 95 SET IN 1992. In addition to the numerous daily records, 18 all-time June high temperature records were tied or broken in Florida last month. In the first 7 days of July, 15 daily high temperature records, including the ones listed above, have been tied or broken in the state. July 8 Update: Added month-to-date chart. Today's cool high of 81° and low of 66° keeps the monthly average so far essentially unchanged at 73.4°. With a daily high matching the long-term normal of 88°, Washington DC is closing out a very cool first week of July. 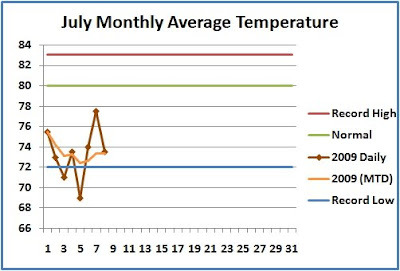 The monthly average so far of 73.5°, if continued through the month, would put this July firmly in the top 10 coolest. The current average is just 0.1° ahead of the third place holder, 1888. 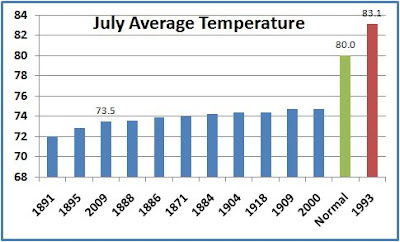 The coolest July of this century has been the one in 2000; at an average of 74.7°, it's tied with 1909 for tenth place, ahead of all but 2 other years in the 20th Century, 1904 and 1918, both at 74.4°. The long-term normal for July is 80°, and the warmest ever recorded was 83.1° in 1993.